(Cambridge, 2009) xii + 243 pp. Reviewed by George Levine on 2009-12-01. This is a brilliant, original, often difficult, but ultimately satisfying book. It is also very ambitious, for it sets out, by focusing on South America as an object of European travels and voyage narratives, to analyze and indeed reconstruct the construction, or "invention," as Schmitt puts it, of "the human as natural." This is no small task, and it requires of Schmitt the identification of a technique, "mnemotechnics," that gives to the human its distinctiveness: "the human is the animal that remembers it no longer is an animal, the savage whose sole remaining connection to savagery is in memory" (p.4). I am no fan of the word "mnemotechnics" or of Schmitt's tendency to go for the most arcane possible language, and the most strenuously theoretical formulations, but the price of the strain is worth it. The payoff emerges from the strength of the argument, the ultimately moving engagement with the subject, the freshness of the material considered, and the unequivocally brilliant analyses of language that mark every chapter. Moreover, the sentence I've just quoted gives a hint of Schmitt at his best, which is very good indeed. The argument, from chapter to chapter, is complex, and Schmitt always manages to double back where necessary, to avoid reduction of his authors to the places they might have taken in most current criticism - as exploitative (consciously or no) ambassadors of empire. The four figures who get fullest attention here are Darwin, A. R. Wallace, Charles Kingsley, and W. H. Hudson, and their work is considered with a wonderful freshness that is nevertheless tightly controlled thematically. For each of these, South America, evolution, and savages are critical to the imagination and the science, and what holds all the writers and all the various versions of the past together is memory - the "memory" of a pre-civilized, even animal past. At the center of the discussion are "evolution" and the consequences of that theory both for our imagination of "savages" and for our understanding of ourselves, for what it means to be human, in relation to savages - hence "savage mnemonics." Geographically, in a move that is particularly interesting and at the very foundation of the book, the focus is on South America (rather than on the Africa that has figured so prominently in colonial and post-colonial discourse). Schmitt discovers throughout Victorian writing the imagination of South America "as an immense site of memory" (1). Why should South America matter to an imperial culture that had very little territorial foothold there compared to what it had in Africa and Asia? Odd as it may seem, South America met Britain's needs precisely. As it comes to seem no accident that Darwin's first encounter with "savage" in their native land is first in South America, so it was also for A. R. Wallace. South America is not only a place of imperial expansion but an idea and ideal. In part because Britain's imperial ambitions there had less to do with conquering and more with banking, exploring, and commerce, it was still for Victorian explorers and readers a less spoiled landscape than the kind we find so famously delineated in Heart of Darkness. It is a landscape that (until the chapter on Hudson describes it anew) seems to allow real access to the past. South America for Schmitt's writers is living memory, and so it was for much of British culture. For Wallace, unlike for Darwin, the savage past turns out to have been more civilized and human and humane than contemporary civilization. For Arthur Conan Doyle in his fictional The Lost World, as Schmitt points out, it is the place to go if you want to see what the prehistoric world really looked like, even to see dinosaurs! Nothing could better represent the sense of the deep pastness of South America. And for Kingsley it is a place already enshrined in history by writers like Darwin and Wallace, again an ideal of the past for which Kingsley is an inevitably belated aspirant. In a curious way, as Schmitt impressively demonstrates, Kingsley's belatedness makes South America familiar and at home - almost the real heart of England, and it is a belatedness that Kingsley embraces. He is early enough to identify some of the plants and animals his predecessors had discovered, but too late to be the first to identify them. For Hudson, a writer who usually gets far less attention than (by virtue of Schmitt's description and analysis) he deserves, South America, the living past, is also the place in which that past is being irrevocably destroyed, an ideal passing. His work becomes a lamentation for a beautiful and wild past, a struggle to resist the incursions of civilization. 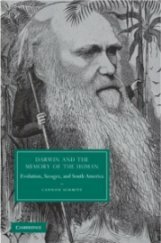 The initiating point of the book, and one that gives to all that follows a coherence and formal clarity that is in itself extremely impressive, is a set of familiar passages in Darwin's writing: first, his observation that "the sight of a naked savage in his native land is an event which can never be forgotten" (Autobiography, qtd. 38), and second his response to first seeing Fuegians in their native land: "Viewing such men, one can hardly make oneself believe they are fellow creatures, and inhabitants of the same world." (Voyage of the Beagle, qtd. 39) Much of the power of Darwin's statement lies in his recognition that they are "fellow creatures," and that - as his theory develops - they are therefore humans, like him, if buried deep in his own pre-history. Much too derives from Darwin's revulsion, a revulsion, Schmitt reminds us, that Darwin does not feel about his descent from animals and ape-like creatures. And finally, there is the idea that all of Darwin's work verifies: he never can "forget" his first sight of those "fellow creatures." Schmitt is certainly not the first critic to argue that Darwin's sighting of the Fuegians was absolutely critical to all he did even though he barely mentions mankind in On the Origin of Species. But Schmitt makes something fresh and important out of his focus here. Through the book, he juxtaposes Darwin's experiences and insights with those of other travelers who likewise found the experience of "savages" unforgettable, but who cast the savages in extravagantly different roles. Memory comes in many varieties, and Schmitt teases those varieties out as he proceeds, all the while making a remarkably strong case for the centrality of South America and evolutionary thinking in the construction of memory and of our Western sense of human identity. To be reminded of the "baseness" of our origins is horrifying to Darwin and many of his readers. Darwin's willingness and cheerfulness in the face of his discovery that we are all descended from animals disappears when he thinks about the Fuegians: "to be descended from an ape," he wrote, "is less repellant than to be descended from a savage" (117). But there is another kind of "memory," Schmitt argues. To remember the dignity and humanity of our "savage" ancestors puts Wallace in quite another place from Darwin's and leads to some startling but convincing conclusions. Given books such as Adrian Desmond and James Moore's recent Darwin's Sacred Cause (2009), we now know very well that Darwin was profoundly hostile to slavery. But it is striking that his revulsion from the "savages" allows him to accept colonialism without question, while Wallace's sense of the noble savage allows him - drives him - to question it. (It is striking too to consider, as Schmitt makes us do, that Wallace's falling away from the strict naturalist concept of evolution was largely provoked by the savage's inexplicably advanced state. He could find no way to explain such moral and social dignity as developing through natural selection). While admitting that Wallace did vacillate on the issue, Schmitt nevertheless shows that Wallace "finally announces as indisputable the superiority of the savage over the civilized in all areas of life except the material or technological" (73). The book is impressive in many ways - in particular, in its formal coherence and its brilliant attention to language. Schmitt is a remarkable reader, capable not only of making connections (which is what gives the book some of its formal power) but of making the language he stops to read for us alive with possibilities that casual reading would certainly miss. He never lets any passage lie still, and frequently he will offer a careful reading and then return again to plumb newer depths. The consequence, inevitably, is that his arguments take us beyond familiar reductionist conclusions. For example, it is easy these days to take as conclusive Mary Louise Pratt's argument, cited by Schmitt, that "scrutiny of the natural world" was always linked to the "potential for settlement and concomitant agricultural production" (p. 103). Natural history is never disinterested, always complicit. Schmitt recognizes the cogency of the argument, but when talking about Kingsley, whose book At Last (and particularly its title) he subjects to exhaustive analysis, he claims (and confirms by detailed readings) that Kingsley's "investment in negotiating a complex set of temporalities makes it difficult to read as a straightforward rationale for expansion" (103). As the book proceeds, it gets increasingly comfortable with itself, and in a fine "Coda" Schmitt brings his themes - evolution, memory, savagery - together in a way that makes clear the larger significances of his enterprise. "To speak of memory at the end of the twentieth century and the beginning of the twenty-first has been of necessity to speak of loss," he claims, and there is an elegiac quality, begun most overtly in the penultimate chapter, on Hudson, but foregrounded at the end. "Recalling the ubiquity of destruction stands as the sine qua non of understanding evolution." Schmitt expands his range here, taking us to contemporary "memory studies," but also to W. G. Sebald's Austerlitz, and making nineteenth-century and contemporary writers and experiences speak to each other. The vision is dark and moving, as Darwin leads us toward a recognition that people are "animals haunted by the loss of what they imagine comes between them and other animals - 'savages' - and as though the only way to free themselves from such haunting were to remember that the loss makes them who they are" (162). The double movement of this final sentence captures beautifully the paradoxical vision that through its details the book constructs for the reader. Though this book gives us little to complain about, Schmitt's insistence on the mechanism of memory can sometimes seem strained. In representing his writers' paradoxical or vacillating positions, Schmitt himself seems to acknowledge the strain: he writes of pasts the writers did not have but have read about, and of things "forgotten" that are not not literally "forgotten" but in fact rejected for personal or ideological reasons. When Wallace recognizes that the savages he encounters are not like the savages he has read about, Schmitt contends, he had to "relearn to see," and was thus "forgetting all he thought he knew about them" (81). "Forgetting" is here certainly figurative, as it seems to me "memory" is often throughout the book, for it takes the human imagination of our pre-historic savagery as something genuinely experienced, which as civilized people we try, unsuccessfully, to forget. As a sometimes literalist, I have trouble with this metaphorical slide, and this despite my sympathy with Schmitt's project of reading the development of modern human self-understanding through "memory" of our relations to the pre-civilized past that evolution intimates. Memory works sometimes, but not, I think, always. And modifying the notion of "mnemotechnics" would not seriously hurt this wonderful book. George Levine is Emeritus Professor of English at Rutgers University and Distinguished Scholar in Residence at New York University.